“Are you having a good time?” asked the Soweto Gospel Choir as they neared the conclusion of their fourth visit to Boston over the years. Again and again: “Are you having a good time?” And again and again the virtually full house roared back with unqualified approval. 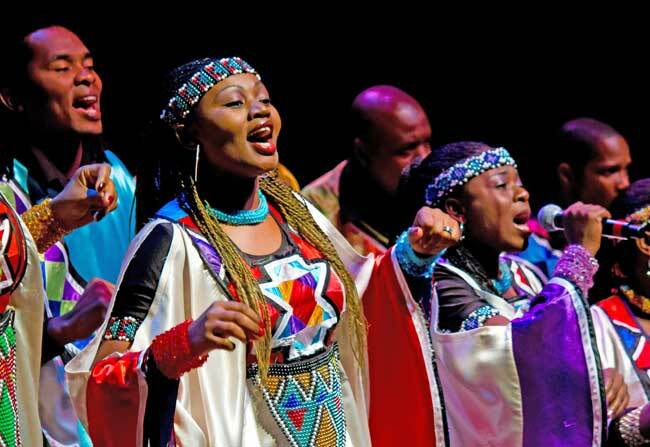 Garbed in eye-popping colors and designs, the 20 or so exceptional singers, dancers, and instrumentalists, all breathtaking to eye and ear, took the stage at Symphony Hall energizing an audience of all ages with traditional, modern, and gospel styles largely flavored by the well-known choral sounds of South Africa. But it was a contemporary song, Arms of an Angel that meant much, much more than “having a good time.” When the song was over, applause erupted everywhere and more people stood up than remained seated. Fabulously pure singing in solo, duet, and other combinations, with an equally fabulous guitar whose commentary seemed to summon up animal calls from all around — this surely was the winning entry. It was so deeply moving and so genuinely expressive of a Soweto culture, Soweto being an urban area of the city of Johannesburg in Gauteng, South Africa. Like so many of the numbers on the program, the essence of Meadowlands was entrancement, holding our attention and producing a sense of wonder in us all. Soweto’s introduction to their program did not fail to point to our blessings and thanks, a profound thankfulness and spiritual conciliation. With their upbeat, joyous, all-out harmony there was exuberant drumming, an awesome athletic dancing, and an irresistible, infectious swaying that found endless manifestations. There was also a competitive element in the show; in one song, we saw male and female singers trying to outdo each other, in the traditional song, Thula Mama. Soweto had the audience having a “good time” clapping Soweto rhythms and waving its arms in unison, reminiscent of rock concerts with American youth melding. Symphony Hall rocked! Happiness flooded the hall. In the lobby, while Soweto pleased its voracious audience with yet another — and another – number (Ipi Tombi and Oh happy day), I saw a Boston police officer smiling with a reserved but visible expression of enchantment, a veteran usher in tux putting on some Soweto moves before other ushers, and a young usher happily clapping away to the sounds. Celebrity Series President and Executive Director Gary Dunning welcomed many familiar as well as new faces in his opening welcome. “Celebrating the human voice… bringing the best artists… to inspire and enrich our community… bringing a richer and more diverse artistic life” were his words. Maybe more will cross over borders.